Money management may very well be the most important piece of thetrading puzzle. 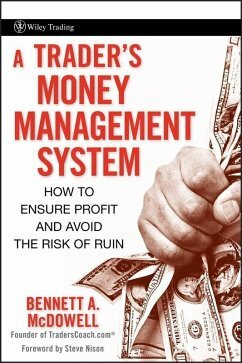 In A Trader's Money Management System,expert Bennett McDowell provides time-tested techniques that canturn a losing trader into a winning one?and take the winning traderto an entirely new level. In revealing his personal approach tostaying out of trouble in the financial markets and maximizingprofits, he offers comprehensive insights into: * The psychology of risk control as well as the finer aspects ofsetting stop-loss exits * The value of managing trade size and consistent recordkeeping * The process of putting together your own personal moneymanagement system Unlike other books that focus on the complex mathematicaltheories behind money management, this book presents its system instraightforward, easy-to-understand terms that will allow you toquickly see how these concepts work and immediately benefit fromthe value of effectively managing risk. Bennett A. McDowell is the founder of TradersCoach.com(r) and an expert in technical analysis and complex trading platforms. Earlier in his career as a financial advisor, McDowell used his own proprietary trading system to serve a community of high-net-worth clients. This system is now known as Applied Reality Trading(r), or ART(r), and is used by traders around the world in over forty countries. McDowell lectures nationally and writes articles for many leading trading publications, including Technical Analysis of Stocks & Commodities magazine. He is a recognized leader in trading education and is honored to be included as a member of the eSignal "Trading with the Masters" team. McDowell is also the author of The ART(r) of Trading, which is published by Wiley. Your Risk Profile and Discipline Profile. Chapter 14. Risk Management Rules to Choose From. Epilogue. Appendix A. Getting Started with Your Trade Size Calculator Software. Appendix B. The Trader's Assistant Record Keeping System. Appendix C. The Art Of Paper Trading. Appendix D. Resources. Glossary. About the Author. Index.